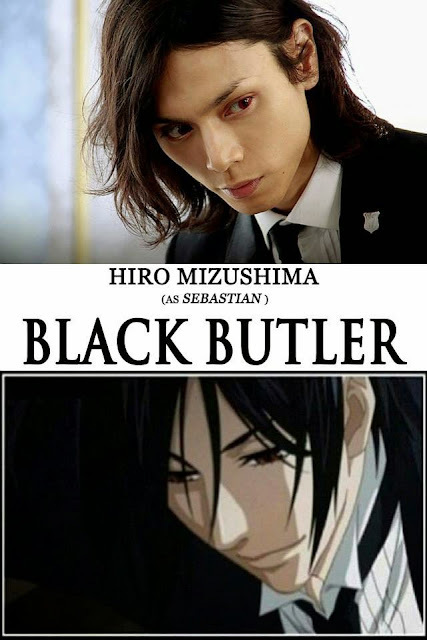 Following a string of adaptation to theatre, magazines and video games, the widely read manga series “Black Butler” written and illustrated by Yana Toboso has also been adapted to a movie starring Hiro Mizushima and Ayame Gouriki. The movie “Black Butler” revolves around a “flawless demon butler” character named Sebastian Michealis who personifies grace, knowledge, and physical perfection as he investigates dark and mysterious incidents. Eventually, he was summoned by an orphaned aristocrat to exact revenge at the price of her soul. "Black Butler" story was originally set in the 19th century, in the ruling era of Queen Victoria but the film is set in the year 2020 to allow for a more reasonable mingling of Asian-European cultures. In the movie, Shiori Genpo (Ayame Gouriki) runs the large corporation Funtom. Shiori is also a descendant of the prestigious noble family, Phantomhive of England. In order to hunt down the murderers of her parents, the orphaned aristocrat summons a demonic butler (Hiro Mizushima) to aid her. Sebastian's job is to protect Ciel until her revenge is fulfilled, then he will consume her spirit. Directors Kentaro Otani and Keiichi Satou assures fans that even though the movie’s setting is unlike the original, they took very careful note not to disappoint fans of the original. Hiroyasu Koizumi, who is in charge of the art concept says that the idea for the setting is that it is not limited to any nationality or age. Mizushima, who plays the titular role shed more than an ample amount of weight for the role. A Japanese actor, producer, writer and creative director, Mizushima also took part in the movie’s post production process. “Black Butler” will open July 23 exclusive in SM cinemas nationwide from Axinite Digicinema.